Cardoons (Cynara cardunculus) is not a very common vegetable, either here in the UK or indeed in Italy, where, however, they make the occasional appearance in the shops. One of the odd and little known vegetables that are kept alive by elderly people eating them and that have seen better days, when they even had different regional names (while "cardi" is their Italian name, my mother-in-law from central Italy calls them "gobbi" or "hunchbacks" as they sometimes come in a bent shape) or maybe have ever only had primarily regional relevance (like the "bitter roots of Soncino", Cichorium intybus, my auntie loves so much, or the "lampascioni", Leopoldia comosum, my husband's granny calls such a delicacy), and are slowly being forgotten in our globalised world. 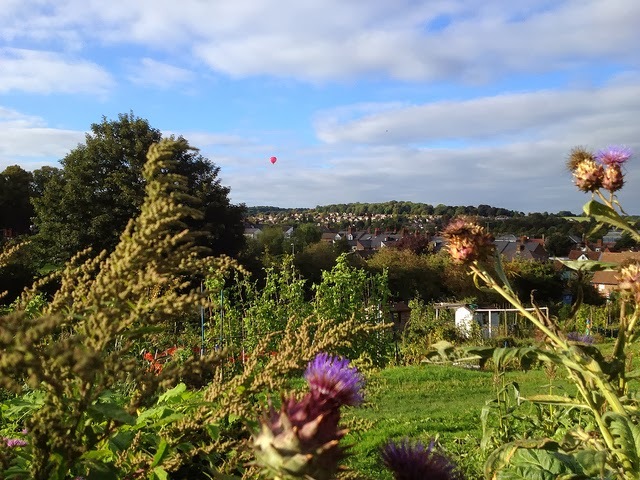 Cardoon is however a rather nice vegetable, and, what is more, it is available in the winter, when variety in the vegetable garden may be limited. C. cardunculus is a perennial, which makes it more interesting for me as less effort produces more crops. 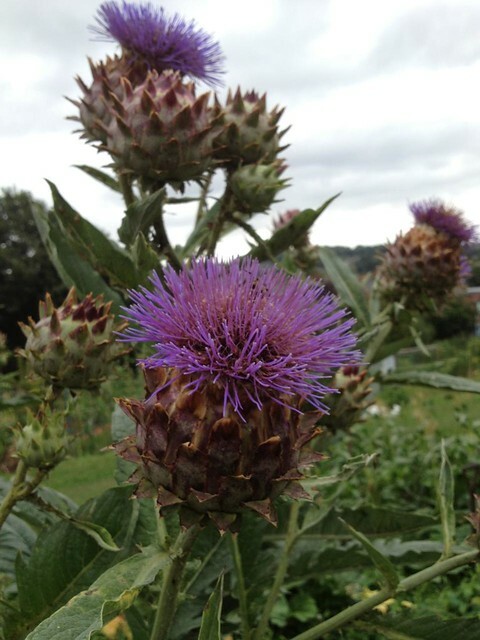 In particular, cardoon is a herbaceous perennial, which means it dies back after flowering in late summer and grows back in the new season. My cardoons have flowered beautifully every year, rising to 2+ metres high with their mighty purple thistle-like flower heads, covered in bees. As a plant, they also attract quite a lot of green and blackfly (possibly away from other crops) and with them plenty of ladybirds (mostly harlequins, but what can you do). Because of the flowering, they have then died back and I had no opportunity to taste them. I have been a bit downhearted because of that, until I found that Riverford the-professional-veg-growers themselves have tried and failed to grow them this year, so that cheered me up a little. Shortly after that, I spotted one of the plants had grown back straight after flowering. This was my opportunity! As you eat the stalks, like with rhubarb, and chlorophyll makes them rather bitter, you need to blanch them. I wrapped the leaves in some fleece and came back after a couple of months. 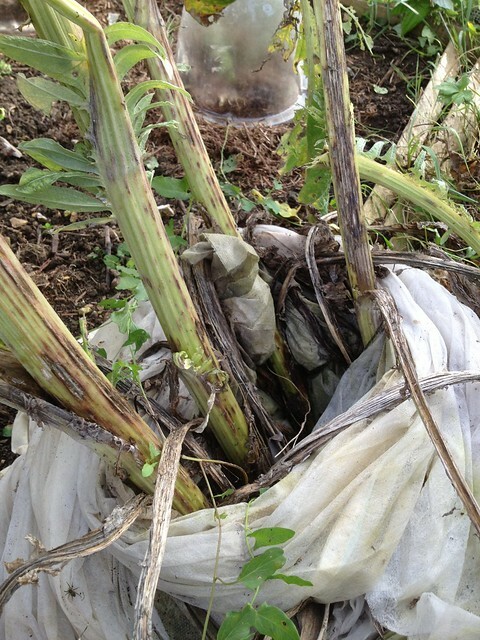 The stalks looked rather miserable, as the slugs had obviously had a great time with them. But I decided to have a go anyway. Oh I was so glad I did! You need to strip the leaves and peel back any stringy fibers from the ribs (as you do with celery). Cut them in large chunks and keep them in acidic water (with lemon or vinegar) to prevent them from going black (as with artichokes). Even if you blanched them in the field, you will have to blanch them again in salty water until they are tender but not mushy. Here is how they looked after I took them out of the water. I can assure you they looked much better after they went into the oven with some butter, mozzarella and grated parmesan on top, and came out coated in a nice, crispy cheese layer. They tasted sweet, mildly artichokey: delicious! They did not last long enough for a picture. And the husband test never fails. Definitely something I will need to work on this year. I am going to grow more plants, and flowers buds may need to be removed, altogether, or maybe just cut back early in the season, so the plant has time to recover (I quite like the idea of the flowers). And I have to find the most suitable material for wrapping them and keep out the slugs. Unfortunately there is not much information that I could find either in books or online. 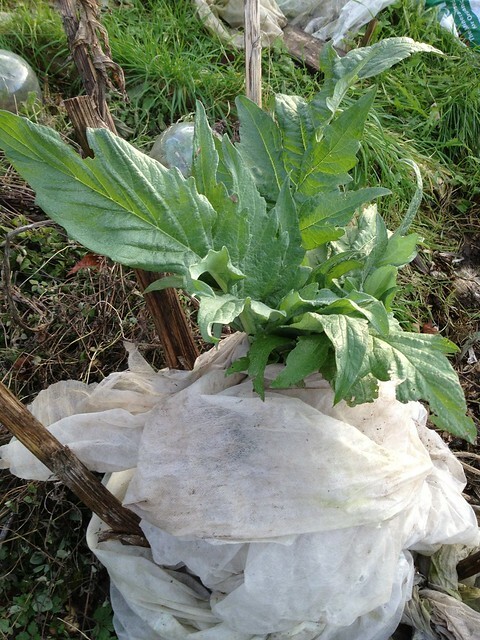 Riverford went all the way to Italy to learn the tricks of growing cardoons - I tried asking them if they could share it, but I've never been too lucky getting answers from them on social media. I'll try to investigate with my Italian network... I'll get there somehow! What a worthwhile pursuit to restore an orchard!